Who didn't love Pop Rocks in the 1970s and '80s? Apparently, the formula was developed in 1956, but it wasn't until 1975 that the candy came out in 15-cent packs. We all thought it was a pretty daring candy, and felt a bit proud to be chomping them down. The urban legend about Mikey from the Life cereal ad eating them, downing some Coke, and then exploding only added to their mystique. Not to mention limited-edition flavors, like candy cane at Christmas. 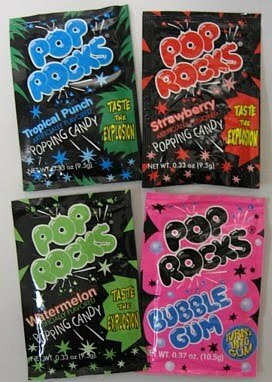 Were you, or are you, a Pop Rocks fan? Do you remember them causing a fuss on your playground when they first came out? Do you ever see them in stores today? We had Space Dust in my locale, which was apparently leftovers from the bottom of the Pop Rocks bin at the factory. At least until the big PCP scare of the late '70s, when they reportedly saw fit to change the name to Cosmic Candy. Has there ever been a food with as many urban legends attached to it as Pop Rocks? The Mikey story is arguably one of the best known ULs around (poor Mikey is a UL treasure trove in of himself!) Other Pop Rocks urban legends I can recall from years past are: Pop Rocks are an aphrodisiac... crushing Pop Rocks and snorting the dust makes you high... Pop Rocks contain traces of TNT and can literally blow your head off... feeding Pop Rocks to small animals will make them explode... Pop Rocks were invented by the Nazis or the KGB (take your pick) as a tool for torturing prisoners. As you note in the article, all this danger and drama simply added to their allure.